I love it when you get something from purchasing. This month of June, The Faceshop Philippines has an exciting promo for all. 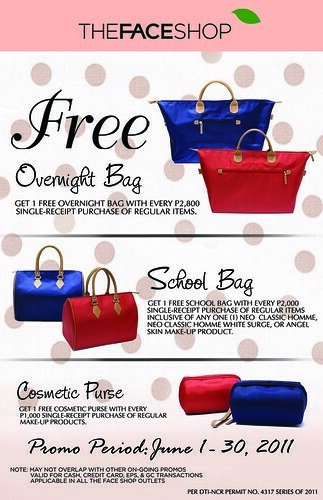 When your purchase at any The FaceShop branches amounts to P2800 and above, you get a free chic overnight bag. For every P2000, you get a school bag. Perfect for all the young ladies out there. So if you're planning to buy some nice nail colors, uber chic makeup or that famous Changpo shampoo from The Faceshop, now is the time ladies!